The Trustees of Ngā Mātarae Charitable Trust are pleased to offer the Ngā Mātarae Scholarship Programme. The Trust is a partnership between the Port and Tauranga Iwi with the primary purpose to promote the wellbeing of Te Awanui Tauranga Harbour. Applicants intending to undertake study in a discipline that will benefit the wellbeing of the harbour and who are descendants of Tauranga Moana iwi (Ngāti Ranginui, Ngāi Te Rangi and Ngāti Pūkenga) are invited to apply. The Chair of Port of Tauranga Limited, David Pilkington, today announced the appointment of a new Director, Robert McLeod. Rob joined the Board of Quayside Holdings Limited in November 2016. Rob is currently on the Board of Sanford Group, and has been a past Board Member of ANZ National Bank, Tainui Group Holdings, Sky City Entertainment Group and Telecom. Rob was Oceania (Australia, New Zealand and Pacific Islands) CEO / Managing Partner for the international accounting practice of Ernst & Young and more latterly as Ernst & Young New Zealand Chair, a position from which he retired on 31 December 2015. Rob McLeod replaces Quayside representative Michael Smith who retires, with effect from 31 October 2017. Port of Tauranga today reported first quarter trade volume growth of 15% on the previous corresponding period. Overall container numbers grew 26%, due to a significant increase in transhipment (containers transferred from one ship to another at Tauranga) in the three months to 30 September 2017. Log volumes increased by 13% compared with the same period last year. Port of Tauranga Chairman, David Pilkington, says the first quarter results are further proof that Tauranga has cemented its role as New Zealand’s hub port. “The trend to larger ships, and those ships making Tauranga their only Australasian call, has led to a significant increase in transhipment,” he says. The largest container vessels to ever visit New Zealand have been able to call at Tauranga since the September 2016 completion of a major dredging project and $350 million expansion programme. Mr Pilkington says the (unaudited) Group Net Profit After Tax is up 15% on the prior corresponding period. “Based on the first quarter’s performance, and notwithstanding any significant market changes, we expect full year earnings to be between $88 and $92 million,” Mr Pilkington says. This compares with Net Profit After Tax of $83.4 million for the year ended 30 June 2017. Port of Tauranga Chief Executive, Mark Cairns, says the Port has ample headroom to handle increasing volumes. Of its 190 hectares of land, the Port has approximately 40 hectares of land still available for cargo growth. “This will allow us to handle around three million TEUs (twenty foot equivalent units) without any further reclamation,” he says. A final ordinary dividend of 6.2 cents per share brings the total ordinary dividend to 11.2 cents per share – a 5.7% increase on the previous year. In addition, a special dividend of 5 cents per share will be paid, bringing the total dividends for the year to 16.2 cents per share. New Zealand’s busiest port, Port of Tauranga Limited (NZX.POT), today announced record annual earnings as freight volumes increased across all major cargoes. Net Profit After Tax for the year to 30 June 2017 rose 7.9% to $83.4 million, from $77.3 million the previous year. The result was lifted by a 13.8% increase in container volumes to a record 1,085,987 TEU, as well as growth in log, dairy products and oil imports. Subsidiary and Associate companies performed well with NPAT up 4.8% to $14.645 million. Annual revenue rose 4.2% to $255.9 million, up from $245.5 million, while EBITDA increased 6.4%, from $143.2 million last year to $152.4 million this year. Port land was revalued during the year increasing by $63 million reflecting the increase in land values over the last two years. Port of Tauranga Chair, David Pilkington, said the results were a satisfying culmination to the Company’s $350 million expansion programme, which included a major harbour dredging project to widen and deepen shipping channels to accommodate larger ships. “As soon as the dredging was finished, larger vessels were introduced on Tauranga-only port calls,” he said. Vessels with nominal capacities of between 7,500 and 11,500 TEU now regularly call on a weekly basis, compared to a pre-dredging maximum of 4,500 TEU ships. “These large vessels are providing New Zealand importers and exporters with very fast, direct and economic services to North Asia and beyond. As Port of Tauranga is the only Australasian port of call on these services, it is an efficient trans-shipping option for Australian exporters,” Mr Pilkington said. As well as larger container vessels, the Port is also seeing larger bulk cargo and passenger ships. The giant cruise ship Ovation of the Seas – at 347 metres long and 50 metres high – made its first visit on Boxing Day 2016 and made two further calls, bringing nearly 4,900 tourists each time to the Bay of Plenty. Port of Tauranga’s five-for-one share split in October has achieved its objective of enhancing liquidity, with daily share trades increasing 45% and total shareholder numbers increasing 14%. The Company today announced a further special dividend of 5 cents per share as part of its ongoing four year plan to return up to $140 million to shareholders. This follows a special dividend of $34 million, or 25 cents per share (pre share split), paid on 7 October 2016. Directors have also declared a final ordinary dividend of 6.2 cents per share, taking total ordinary dividends to 11.2 cents per share, a 5.7% increase on the previous year. Total ordinary and special dividends will be 16.2 cents per share. The record date for entitlements is 22 September 2017 and the payment date is 6 October 2017. Dividends, coupled with the Company’s strong share price appreciation, have lifted total returns to shareholders to 18.7% over the year. They extend a record of the Company delivering a compound annual average return to shareholders of 18.3% over the last decade. Port of Tauranga believes the move to larger vessels will be accelerated by the ongoing restructuring in the shipping line sector. “A hierarchy of fewer hub ports, supported by second-tier feeder ports connected by coastal shipping, is unquestionably the way of the future for New Zealand,” said Mr Pilkington. “The sums of capital required to accommodate bigger ships, the aggregation of sufficient cargo, as well as the transport infrastructure to move it, is clearly not affordable across all of New Zealand’s current container ports,” he said. New services from Maersk, Hamburg Sud and Seatrade, and the larger vessels being utilised by the shipping lines, have had a significant impact on cargo volumes in the year to 30 June 2017. Exports grew 8.0% to 14.2 million tonnes and imports increased 13.7% to 8.0 million tonnes, with strong growth in all the largest cargo categories. Export log volumes increased 20.1% to 5.5 million tonnes and dairy exports increased 4.9% overall. The trend to larger ships calling only in Tauranga is reflected in the amount of containers which were trans-shipped (transferred from one ship to another), an increase of 31.0% to 245,896 TEUs. Port of Tauranga Chief Executive, Mark Cairns, said this was evidence of the inevitable paradigm shift towards a hub and feeder port network in New Zealand. Mr Cairns said the Port’s relationships with major shippers such as Oji Fibre Solutions, Kotahi, Zespri International and Tauranga Kiwifruit Logistics had given the Company the confidence necessary to commit to ongoing investment in capacity. In the past year, Port of Tauranga has commissioned two new Liebherr ship-to-shore gantry cranes and retired Crane #1 after 37 years of reliable service. The Tauranga Container Terminal now has an eight crane fleet and three berth operation, giving it unrivalled berth window flexibility and crane intensity options. The container terminal has been reconfigured to expand the available container storage and handling space. In April, Oji Fibre Solutions moved into our new, purpose-built 22,000 m2 warehouse. Removing Oji’s old shed created space for a further 820 container ground slots right next to the berths. The terminal now has capacity of more than 6,500 ground slots, with refrigerated container connections now at more than 2,300. Mr Cairns said the Port maintained its industry-leading record for productivity. The “net crane rate” for the year increased to 36.2 moves per hour, and the ship rate increased to 89.1 moves per hour – well ahead of New Zealand peers. The average ship rate is also 59% ahead of the average of five of Australia’s largest container terminals. Over the past two years, the number of trains running between Tauranga and the inland port MetroPort Auckland has increased from 54 to 78 per week, with the number of containers transferred by rail increasing 64%. We are currently working with KiwiRail to further increase the frequency of trains to cater for expected growth. In the South Island, the Timaru Container Terminal handled another new record of 84,946 TEUs – more than four times the volumes in the 2014 financial year, when Port of Tauranga took over operations. Port of Tauranga expects that cargo and earnings growth will continue. Mr Cairns said there is still ample capacity to handle increasing volume, with considerable scope to expand within the Port’s current footprint. There are approximately 40 hectares of undeveloped, port-zoned land available for future expansion. Port of Tauranga remains in a strong financial position, with net debt as at 30 June 2017 standing at $374.8 million, compared with $308.4 million at the same time a year ago. Gearing, as measured by net debt to net debt and equity, was 28.7% at year end. “Our focus now is to continue to optimise productivity, remove waste from the supply chain and work with our partners to plan ahead,” Mr Cairns said. Guidance on full year earnings will be provided at the Annual Shareholder Meeting on 19 October 2017. Port of Tauranga, headquartered in the Bay of Plenty, is New Zealand’s largest port and international freight gateway. It operates wharves in Tauranga, Mount Maunganui and Timaru, as well as MetroPort Auckland, a rail-linked inland port in South Auckland and MetroPort Christchurch, an intermodal freight hub in Rolleston. The Port of Tauranga Group includes: Quality Marshalling (100% ownership), a cargo services company; Coda (50% ownership), a freight logistics group; Northport (50% ownership), the deep water commercial port in Whangarei; PrimePort Timaru (50% ownership), the commercial port in Timaru; Timaru Container Terminal (50.1% ownership), which leases and operates the terminal at Timaru; and PortConnect (50% ownership), an online cargo management system. For more information, please visit www.port-tauranga.co.nz. Port of Tauranga’s standard measure of profit prepared under New Zealand GAAP is net profit. The Company has used the non-GAAP profit measure of EBITDA when discussing financial performance in this document. The Directors and management believe this measure provides useful information as they are used internally to evaluate the performance of the group. Non-GAAP profit measures are not prepared in accordance with NZ IFRS (New Zealand International Financial Reporting Standards) and are not uniformly defined, therefore the non-GAAP profit measures reported in this document may not be comparable with those that other companies report and should not be viewed in isolation or considered as a substitute for measures reported by Port of Tauranga in accordance with NZ IFRS. Ministry of Transport Quarterly Container Handling Statistics. Australian Department of Infrastructure and Regional Development. 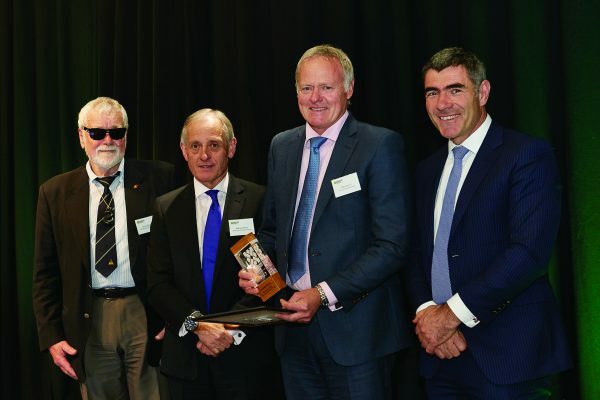 Port of Tauranga is honoured to receive the inaugural Industry Award in the national Biosecurity Awards announced last night. The Awards recognise leadership in support of New Zealand biosecurity. Port of Tauranga is New Zealand’s largest and fastest-growing port, handling more than 22 million tonnes of import and export cargo annually. In the past year, the Port processed more than a million TEUs (twenty foot equivalent units) of containerised cargo, the first port in New Zealand to do so. Biosecurity is an integral part of the Port’s operations and is a joint effort. Port of Tauranga works with importers and exporters, service providers, the Ministry for Primary Industries, New Zealand Customs Service and the Bay of Plenty Regional Council. In 2014, industry representatives Kiwifruit Vine Health and Port of Tauranga launched a partnership focused on achieving operational biosecurity excellence at the Port. It included an awareness programme for staff. “It’s about everyone doing their bit and working together to protect New Zealand’s environment and primary industries from unwanted biosecurity risks,” says Port of Tauranga Chief Executive Mark Cairns. A target pest has been the Brown Marmorated Stink Bug, which likes to hitchhike on containers and has the potential to impact significantly on horticulture sectors. Another risk was cruise passengers disembarking with fresh produce that could be hosting fruit flies. Port of Tauranga today celebrated a new record of more than one million TEUs (twenty foot equivalent units) processed in a year – a first for any New Zealand port. The milestone cements Port of Tauranga’s position as the busiest container port in New Zealand. The one millionth TEU crossed the wharf on 6 June and the Company celebrated with customers and stakeholders at an event today. Port of Tauranga Chief Executive, Mark Cairns, says reaching the one million TEU record is extremely gratifying after taking the strategic decision to become “big ship” capable. “We have spent $350 million over the past six years to get ready for bigger ships and larger cargo volumes. Some were sceptical that average ship size would grow as much as it has, and so quickly,” he says. “We were convinced of the trend towards larger vessels. It has paid off and we saw big ships start to arrive as soon as we completed our dredging programme last September,” says Mark. The dredging programme deepened and widened shipping channels in and outside Tauranga Harbour. The first Maersk ships of 9,500 TEU capacity, 347 metres long, started calling last October. Ships of between 7,500 and 11,500 TEU capacity are now calling on a weekly basis, including a new seasonal service from Hamburg Sud launched in March. “We’re delighted to see shipping lines take advantage of our increased capacity. The economies of scale mean New Zealand importers and exporters can access cost-effective, direct links to international markets,” says Mark. As well as the dredging programme, Port of Tauranga has invested in additional gantry cranes, straddle carriers for moving containers around the terminal, and extended the container wharf length. Storage areas have been increased and additional trains are now transferring containers to and from Tauranga. Port of Tauranga has stepped up productivity to manage the larger cargo transfers per shipment, achieving 64% higher productivity rates than the Australian port average and well above other New Zealand ports. The port is also seeing an increase in the average vessel size of cruise ships and bulk cargo ships, including logging vessels. Royal Caribbean’s cruise ship Ovation of the Seas, 340 metres long and carrying 4,900 passengers, made its maiden visit in December. Port of Tauranga handles more than 20 million tonnes of cargo annually, including 41% of the country’s exports. It is estimated that the port is responsible for 43% of the Bay of Plenty’s GDP. The region has the fastest-growing economy in the country, increasing 7.7% in 2016. New Zealand’s largest freight gateway Port of Tauranga today announced it is on track to become the first port in the country to transport more than one million containers across its wharves in a single year. It also announced a strong 8.5% improvement in Group half year net profit to $41.9 million from $38.6 million in the same period a year ago, as half year trade volumes grew 8% to 11.0 million tonnes and the Port continued to set new national standards for port productivity. Half year Group revenue increased 2.8% to $125.3 million. The Port of Tauranga Board has declared an interim dividend of five cents per share – up 8.7% on the prior year’s interim dividend1. The record date is 10 March and the payment date is 24 March 2017. Chairman David Pilkington said: “Our results show the Port of Tauranga is continuing to reinforce its position as the country’s premier freight gateway. We have lifted revenue and earnings and moved record cargo volumes including more than 510,000 TEU containers. “Exporters, importers and the shipping lines are increasingly recognising the benefits of our deep water port and our efficient freight handling and stevedoring operations. land across the country, prepared the port for large ships and provided importers and exporters with highly-efficient routes to the country’s most important markets. “Our world-class infrastructure will benefit the New Zealand economy for years to come,” Mr Pilkington said. Chief Executive Mark Cairns said: “We are consolidating our position as the port of choice for international shipping lines, with ship visits in the six-month period rising 4% to 774 from 741 in the same period last year. “Following the completion of our harbour dredging programme in September 2016, Maersk introduced a large vessel service, with Tauranga as its only New Zealand call. The 9,500 TEU Aotea Maersk has been a regular visitor since October. “Meanwhile, Hamburg Sud last month announced it will introduce in March a big ship, peak season weekly service, with Tauranga as its only New Zealand call. The largest cruise ship ever to visit the Bay of Plenty – the 4,700 passenger, 1,600 crew Ovation of the Seas – also made its maiden voyage to Tauranga on Boxing Day and has made a couple of further calls since. “It is pleasing to see shipping lines take advantage of the possibilities created by the harbour dredging programme to bring in larger vessels. The economies of scale that come with larger ships drive transport efficiencies and ensure New Zealand exporters retain direct routes to international markets. Ministry of Transport (MOT) figures from the fourth quarter of the 2016 calendar year show a crane rate for the quarter of 35.9 container transfers per hour, compared with the weighted national average of 33.7 moves per hour. “Our ship service rate was 89.8 container exchanges per hour per ship, compared with the national weighted average of 76.9. Such strong results, which rank Port of Tauranga in the top tier of Australasia’s most productive ports, are not only good for our shareholders, they are also in the best interests of the New Zealand freight industry,” Mr Cairns said. During the half year period, Port of Tauranga invested $43.9 million in new infrastructure to further increase storage capacity and productivity. The investments included final payments on the two new gantry cranes commissioned, thirteen new straddle carriers and several property developments at the container terminal. A new purpose-built shed is nearing completion and will be used by Oji Fibre Solutions (formerly Carter Holt Harvey) as a distribution hub, clearing the way for Oji’s former facility to be demolished and new container slots established to further enhance container terminal efficiency. Traffic from our inland hubs continues to grow, with the numbers of containers transferred by rail between Tauranga and our MetroPort facility in Auckland increasing 20% compared with the first half of the previous financial year. Export volumes increased 9% to 7.1 million tonnes and import volumes increased 7% to 3.9 million tonnes. Overall, trade increased 8% to 11 million tonnes. Containers handled increased 8% to 510,074 TEUs. Trans-shipped containers (containers transferred between vessels at Tauranga) increased 2% to 75,583 TEUs. Log exports rebounded from the previous corresponding period, increasing 21% in volume to nearly three million tonnes. Other forest products had mixed results, with pulp volumes up slightly (3%) to 291,000 tonnes but paper products were down 8% to 273,000 tonnes. Dairy product exports increased 4% to 1,088,000 tonnes. Kiwifruit volumes increased 16% to just over 477,000 tonnes, a trend which is expected to continue for the next few years as the industry recovers from the PSA virus. Other produce varied in volumes, with frozen meat exports decreasing by 25%, apples increased by 6%, and onions decreased by 23%. Oil imports increased 10% in volume. Fertiliser imports increased 10% and there was steady growth in other import categories, such as dry chemicals (up 13%), bulk liquids (up 13%), cement (up 5%) and salt (up 14%). Food supplement imports for the dairy industry decreased 10%, and grain volumes fell close to 20%. Subsidiary and Associate profits were up slightly on last year to $8.04 million. In particular, Northport, and Coda had strong performances. Port of Tauranga is well positioned for the remainder of the financial year and beyond. The arrival of the Hamburg Sud service in March should provide a further boost to container volumes and ensure the Company reaches the milestone of handling more than one million TEUs annually by the end of the financial year in June. Given the strong first half result, we expect earnings for the 12 months to 30 June 2017 to be at the upper end of our previous guidance of $79 million to $83 million, provided there are no significant changes to market conditions. The past year has seen us make excellent progress towards our strategy to develop New Zealand’s Port for the Future. Our dredging project to deepen and widen the shipping channels of Tauranga Harbour is complete. This will bring our five year, $350 million capital expansion programme to a conclusion. Already, we have seen this investment come to fruition with the successful maiden visit two weeks ago of the Aotea Maersk. This ship is 347 metres long (or three and a half rugby fields long), 43 metres wide and capable of carrying 9,500 TEUs or twenty foot equivalent units. To put this in context, until now, the biggest ships visiting the port have had capacities of around 4,500 TEUs. Our Chief Executive, Mark Cairns, will talk to you shortly about our operational performance for the year, but first I will touch on the financial highlights. I am pleased to report Net Profit After Tax of $77.3 million. Although this is 2.4% less than the previous year, it is a good result given the million tonne decline in log export volumes. We also had a significant increase of $2.4 million in depreciation charges as a result of our investment in infrastructure. Parent EBITDA rose 2.2% to $125.7 million. This followed a 12.1% increase in container volumes, to a record of over 954,000 TEUs. Our reported revenues fell to $245.5 million, due to a $32 million decrease in revenue caused by having to equity account Tapper Transport following merging it into our Coda partnership. We have announced a final dividend of 30 cents per share, lifting the annual dividend to 53 cents per share – an increase of 1.9%. You will also be aware of the special dividend announced in August. This special dividend of $34 million, or 25 cents per share, is part of a capital restructure aiming to return up to $140 million to shareholders over the next four years, dependent on our requirements to fund any new future growth initiatives over and above those currently planned for. The capital restructure will ensure that we retain a conservatively geared balance sheet, that we remain financially strong with a strong credit rating, and that we can return excess capital to you in a tax efficient manner. On Monday this week, we undertook a five-for-one share split. We decided on the share split based on feedback from our retail shareholders, as well as the analysts’ community, and we believe it will enhance our liquidity in the market. I would like to comment on the year’s performances across the Group, as well as what we can expect in the short to medium future. Our new Coda Group brings together our subsidiaries Tapper Transport, Priority Logistics, MetroPack and MetroBox, as well as Kotahi’s Dairy Transport Logistics. Coda is making good progress at eliminating waste in the domestic supply chain, and ensuring that truck and train trips are full in both directions. Coda has recently opened one of the country’s largest intermodal freight hubs at Savill Drive in Auckland, to consolidate export, import and domestic cargo. Our investments in PrimePort Timaru and Timaru Container Terminal are going very well, with container volumes now having more than quadrupled since 2014. PrimePort has recently celebrated the opening of Holcim’s new South Island cement distribution hub at the port. Northport had yet another good year, with cargo volumes increasing 6.7% to a new record. Northport has plenty of room to expand and is progressively developing paved storage areas. Quality Marshalling had a good year, more than doubling earnings, and has taken a new strategic direction exiting the forestry marshalling sector and focusing on opportunities in niche cargo handling – such as at PrimePort’s new cement hub. It has also expanded its container handling services and equipment. We expect our long-term alliances – with the likes of Oji Fibre Solutions, Kotahi, and more recently Zespri and Tauranga Kiwifruit Logistics – to continue to drive cargo growth, especially in container traffic. These initiatives also shelter us somewhat from swings in individual cargoes, such as last year’s significant reduction in log exports – a decline of more than one million tonnes. Our $350 million investment programme, our extensive land holdings in Tauranga, and our rail-linked MetroPort facility in Auckland, have readied us for this future expansion. Many of you will be aware of the future port study recently undertaken on behalf of Ports of Auckland, in a bid to address the capacity constraints on the existing facilities there. One of the proposals outlined in the plan is that of a new mega port on the Firth of Thames to accommodate Auckland and Tauranga cargo growth over the next 50 years. We have seen no economic justification for this idea, nor have we been privy to the assumptions that led to it. What we do know is that we can significantly expand the volume of imports we can deliver into Auckland, without adding to traffic flows in downtown Auckland. Ultimately, we believe the market will drive any rationalisation required, and we are about to see the efficiencies that can be had from the arrival of bigger ships. I would like to thank my fellow Directors for their contributions this year, especially our relatively new Board members Doug Leeder and Julia Hoare. At today’s meeting, Bill Baylis and Kim Ellis retire by rotation and seek re-election. Both have the unanimous support of their fellow Board members. I will hand over now to Mark to expand upon the cargo trends and operational highlights of the 2016 financial year. Thank you Chairman. Good afternoon Ladies and Gentlemen. I am privileged to be Chief Executive of New Zealand’s largest and fastest growing port, and proud to report to you on another successful year for our Company. The past year has been significant in completing the dredging project, which was the final building block in our $350 million capital investment programme, for the port to be big ship capable – a strategy that we have been planning and successfully executing over the last decade. The strategic partnerships that we have developed with major exporters such as; Oji Logistics, Kotahi, and more recently Zespri and Tauranga Kiwifruit Logistics, have given us the assurances that we needed to commit to our expansion programme on a rational economic basis. On that note, it has been extremely pleasing to see our new infrastructure being utilised so quickly, after the decade of planning and building the infrastructure necessary. Port of Tauranga is the first New Zealand port able to berth ships the size of the Aotea Maersk. The efficiencies that these larger vessels bring are significant, with the associated savings in both fuel usage and carbon emissions critical to ensuring shipping services are sustainable – both commercially and environmentally. Being big ship-capable also enables New Zealand to be included on more mainline shipping routes. The enhanced Maersk Triple Star service will stop in Tauranga en route from South America to North East Asia, giving New Zealand exporters express, direct access to Taiwan, China, Korea and Japan. The dredging has not only been undertaken for container ships. During the year, the world’s largest log ship, the Ultramax class SBI Maia, was chartered by TPT Forests and made its maiden voyage to the port. TPT managed to load 53,000 cubic metres onto the vessel, in what is believed to be the largest single shipment of logs and lumber – around 75% more than an average sized log ship. Cruise ships are always welcomed by the local community and contribute around $40 million of cash receipts to the region over the season. We are in for another bumper cruise ship season this year, and following the dredging completion, the giant cruise ship Ovation of the Seas will be making her maiden visit on Boxing Day this year and then call another two times during the summer. This Royal Caribbean vessel is 347 metres long, 50 metres high and will bring nearly 4,900 tourists to the Bay of Plenty. It should be quite a spectacle coming around the Mount, for Mount Maunganui and Tauranga locals. I have mentioned that our channel dredging project was completed in August, ahead of time and under budget. At low tide, our shipping channels are now 14.5 metres deep inside the harbour and 15.8 metres outside the harbour. Of course, there’s not much point in expanding our capacity in the harbour without ensuring that we match our landside operations to be able to cope with much larger transfers of cargo, required when servicing larger ships. We have increased capacity to more than 5,000 container ground slots at the container terminal, with refrigerated container connections now numbering more than 1,800. We are demolishing Shed 12 at the Northern end of the Terminal and reconfiguring the layout to add a further 650 ground slots for containers and to provide our long term partner Oji Fibre Solutions with a new enhanced 22,000m purpose-built facility, at the southern end of Sulphur Point. Two additional ship to shore cranes and 13 additional straddle carriers have been delivered, and following the retirement of Crane #1, the oldest Leibherr crane in the world at 38 years young, we will have an eight crane fleet servicing three berths in the container terminal by the end of the year. The new super post-panamax cranes will allow us to continue to improve on the world class levels of productivity through the Terminal. Our best vessel productivity over the year was achieved on the ANL Barega at a sustained 127 moves / hour over the vessels exchange. KiwiRail are crucial business partners of the Port. In Auckland, KiwiRail is investing $15 million in upgrading the facilities at MetroPort, which include; expanding MetroPort’s footprint, additional container reach-stackers, and installing a new entrance and gatehouse. We’re very happy about this, as MetroPort saw a huge increase of nearly 40% in container volumes during the 2016 financial year. We are also working with KiwiRail to implement a vehicle booking system early next year to improve truck turnaround times at our South Auckland freight hub. It is worth noting that our partnership with KiwiRail has seen cargo volumes equivalent to more than 450,000 trucks trips transported between Auckland and Tauranga. From a Government Paris Accord commitment perspective, this saves around 21.3 million litres of diesel and 58,000 tonnes of carbon emissions over the past year alone. Meanwhile, in the South Island, we are also handling record numbers of containers through our associate company, Timaru Container Terminal. The Terminal handled an all-time record of more than 84,000 TEUs – an increase of 18% on the previous year and more than quadrupling the volumes since we took over running the terminal in 2014. Our South Island-based customers can now use MetroPort Christchurch, which we have modelled similar to our MetroPort Auckland operation, and which we have successfully grown from zero business in 1999, to handling more than 260,000 TEUs this year, making it the fourth largest container terminal in New Zealand. I will now quickly recap on the cargo trends that we observed during the 2016 year. Total trade decreased slightly (or 0.3%) to 20.1 million tonnes, largely due to the million tonne decline in log volumes. Exports decreased by 1.2% to 13.1 million tonnes, while imports increased over the year, by 1.4% to seven million tonnes. As I have mentioned, container traffic continued to grow strongly, especially in imports. Sawn lumber exports held their own, and pulp and paper exports grew 5% in volume. Dairy exports were up 22% to just over two million tonnes. As a result of our collaboration with Kotahi, we now handle 99.5% of Fonterra’s North Island’s dairy exports. Fertiliser base imports were down 10%, stock feed down 28%, and bulk liquids down 23%. Kiwifruit has been a star performer, with export volumes increasing 21% and expected to continue growing at a strong rate. During the year, we entered into a formal ten year partnership agreement with Tauranga Kiwifruit Logistics and Zespri to ensure that all parties take a long term perspective to providing the requisite infrastructure to cater for the future growth in kiwifruit. To that end, we have just let a construction contract to replace the aging 30 year old kiwifruit coolstore at Mount Maunganui. One of my highlights for the year was the continuing improvement in our safety culture, with our Total Recordable Injury Frequency Rate reducing more than 60% to 5.6 incidents per million hours worked. Our team’s heightened health and safety awareness has resulted in a 154% increase in safety-related observations – which signals to me a greater personal accountability for safety, with everyone looking out for themselves and each other. We will continue to insist that safety is our number one priority at the port. Above all else, we value human life and expect that all of our port colleagues will go home to loved ones at the end of their shifts, and in the same condition that they entered the port gate. I am immensely proud of our Port People, who provide the Company with our greatest source of competitive advantage. Our people work around the clock, in all weathers, and thrive on the challenges presented to them. They embrace our culture of continually striving to do things better and demonstrating an enduring “can do” attitude to doing business with our customers. Before I wrap up, I’d like to update you on our performance in the first quarter of the 2017 financial year and contrast this with the same period last year. A reasonably positive start to the year, with trade up 5%, log volumes up 16%, dairy volumes up 12%, and container volumes up 3%. We have Parent Net Profit After Tax up 10% and Group Net Profit After Tax up 6% on the prior corresponding period. We expect to handle more than one million TEUs in the full year ending June 2017 and expect to see log exports recover to 2015 levels. No matter the fluctuations in individual cargoes, we believe our diverse product mix, income sources and locations will protect us somewhat. We also believe our long-term freight agreements with major exporters give us some certainty to our planning and infrastructure investment. Provided there are no significant change to market conditions, we expect to achieve full year earnings in the range of $79 million to $83 million. Finally, I would like to thank most importantly our customers. They have supported us in meeting our challenges and aspirations – by working together, we have created New Zealand’s Port for the Future. We look forward to the remainder of the year, and the years ahead, with confidence. Parent EBITDA for the year to 30 June 2016 rose 2.2% to $125.7 million from $123 million in the prior year as container traffic rose 12.1% to a record of more than 954,000 TEUs – up from 851,000 TEUs in the prior year. These gains were offset by a decline in bulk cargoes reflecting continuing challenges in New Zealand’s forestry and agricultural sectors. Notably, log exports fell more than one million tonnes with declines also in imported stock feed and fertiliser. Reported revenues fell to $245.5 million from $268.5 million, due to a $32 million decrease in revenue as a result of having to equity account Tapper Transport as an associate company within our Coda partnership. Net Profit After Tax fell 2.4% to $77.3 million as the Company’s largely completed $350 million five year investment programme resulted in higher depreciation charges, which are up $2.7 million in the current year alone. Port of Tauranga Chairman, David Pilkington, said: “We are very pleased with the progress that has been made against our long term strategy to extend our freight catchment to become the country’s leading freight gateway and to prepare to welcome the arrival of the large ships into New Zealand waters. “Strategic initiatives such as our alliance with OJI Fibre Solutions, Kotahi and Zespri / Total Kiwifruit Logistics continue to drive a strong increase in container volumes to the port. These initiatives have also insulated the Company from this year’s significant reduction in log exports. “Our strategy has allowed the Company to make the significant investment required to host the next generation of big ships without compromising our commitment to deliver sustainable returns to our shareholders. “It is also delivering benefits to the broader New Zealand economy. Following the completion of dredging to deepen and widen the port’s shipping channels, the first of these large container ships is set to visit in October. Over the long term, large ships have the potential to deliver in excess of $300 million in annual savings to the country’s exporters and importers. “Port of Tauranga continues to consolidate its position as the country’s leading freight gateway. With our $350 million five year investment programme largely complete, we have capacity to continue to grow freight volumes for the foreseeable future and importantly relieve constraints now emerging elsewhere in the country’s port infrastructure. “As signalled at our Annual Shareholder Meeting last year, the Board has reviewed our capital structure following completion of a major investment programme and today announced a return of $34 million to shareholders by way of a special fully-imputed dividend of 25 cents per share. This is the first tranche of what is targeted to be up to $140 million to be returned to shareholders over the next four years. The final amount returned is dependent on our requirements to fund any potential future growth initiatives,” Mr Pilkington said. Directors have also declared a 30 cent fully-imputed final dividend, which combined with the special dividend lifts total payments to shareholders for the 2016 financial year to 78 cents per share. The record date for dividend entitlements is 23 September 2016 and the payment date is 7 October 2016. Mr Pilkington said the capital restructure will ensure the Company has a more efficient Balance Sheet, remains financially strong and returns excess capital to shareholders in a tax efficient manner. “A return of the full $140 million to shareholders would still ensure the Company retains a conservatively geared balance sheet and an investment grade credit rating,” Mr Pilkington said. Separately, the Company today announces a share split. Shareholders will receive five ordinary shares for every one ordinary share held at 5 pm on the record date of 17 October 2016. Port of Tauranga Chief Executive, Mark Cairns, said: “The arrival of the first large ships in October will usher in a new era of sea-borne freight transport in New Zealand. “And it is not just larger container ships that are calling at Tauranga. The 200 metre long 35,000 tonne SBI Maia, chartered by TPT Forests, the world’s largest log carrier, has also started calling and we will host Royal Caribbean International’s mega cruise ship Ovation of the Seas this summer. “It is gratifying to see our new infrastructure, including the recently deepened and widened shipping channel, being used so quickly after so many years of hard work. Port of Tauranga Chairman, David Pilkington, said: “It is clear that port capacity in Auckland is becoming constrained. Thanks to our investment programme, our extensive Tauranga land holdings and our rail-linked MetroPort facility in Onehunga, we can significantly expand the volume of imports that can be delivered into Auckland. “Such an approach will have the additional benefit of reducing traffic flows in downtown Auckland and negate the need to expand the city’s port operations further into the Waitemata Harbour. The channel dredging project has now been completed ahead of time and below budget. The port’s shipping channels have now been widened and deepened, to 14.5 metres inside the harbour entrance and 15.8 metres outside the harbour. Port of Tauranga has examined every aspect of its landside operations to ensure it is able to handle the much larger transfers of cargo required when servicing larger vessels. Two additional cranes and 13 additional straddles have now been delivered. KiwiRail is investing $15 million in upgrading its facilities at MetroPort Auckland, which saw an increase of 39% in containers volumes during the financial year. Meanwhile, in the South Island, Timaru Container Terminal reached an all-time record in container volumes of 84,402 TEUs – up 18% on the previous year. South Island-based customers are now able to access the MetroPort Christchurch intermodal freight hub at Rolleston, which can consolidate imports and exports for rail transfer to and from the Timaru terminal. Total trade in the 2016 financial year decreased 0.3% to 20.1 million tonnes. Exports decreased by 1.2% to 13.1 million tonnes, while imports increased by 1.4% to seven million tonnes. Container traffic continued to grow apace, with container throughput increasing 12.1% to 954,006 TEUs. The largest increase in containers was in imports, which increased by 34,260 TEUs. Milk powder exports increased 21.5% in volume, to just over two million tonnes. Kiwifruit volumes increased 21.1% and are expected to continue growing at this rate. Volumes of value-added forest products also increased, including pulp and paper exports growing by 5%. Exports of logs decreased 18.2% in volume to 4.6 million tonnes. Dairy industry-related imports decreased, including fertilisers (down 10% to 472,000 tonnes), and stock feed (down 28.2% to 1.073 million tonnes). Over the last four years, the Company has managed to maintain Net Profit After Tax despite a reduction in log export volumes of more than one million tonnes and an increase in interest and depreciation charges of $9.5 million relating to the $350 million capital expenditure programme. “As previously guided, following the introduction of the new shipping services we expect to handle over one million TEUs in the year ended June 2017. We expect to see log exports increase to 2015 levels with other export cargoes, such as kiwifruit, expected to continue their strong growth trajectory,” Mr Cairns said. “We will provide 2016/2017 full year earnings guidance at our Annual Shareholder Meeting on 20 October 2016, when we have a better feel for the first quarter’s trade volume” said Mr Cairns. The Question of Bigger Ships, New Zealand Shippers Council, August 2010.